Happy Monday! I’m so excited to bring you today’s post because it brings a big announcement that combines some of my favorite things. I’ve teamed up with Amanda at The Happy Arkansan and Natalie at Natalie Patalie to bring you the Blogger Book Drive! I’m super excited because this project combines my love of reading with charity for kids! In the month of August, we are encouraging bloggers (and blog readers) to donate a little to First Book through our link. For every $2.50 donated, First Book will give a child in need a book. This company looks for the places with the most need to donate these books. Did you know that almost half of the kids in our nation live below the poverty line? That means most don’t have access to proper nutrition, let alone good books. We’ve set a goal of raising $200 to help enhance literacy for these kids. That’s 80 books. We would love to exceed our goal. We hope you’ll help by supporting the first ever Blogger Book Drive. And now for this week’s topic – my top five children’s books! Curious George is one of my all time favorite stories. I love the way this series brings to life the antics of a monkey and his friend. George is always getting into some sort of mischief and learning something from it. I love that his heart is always in the right place with his antics and that they always work out in the end. This is another one of my favorites. This book is the story of a teddy bear who is left sitting on the shelf time and time again because he has a button missing. He figures this out and goes on a search for a button in the department store. I love the adventure this tiny bear goes on. I don’t want to give away the ending of the book, but let’s just say it’s a heart warming story. This is my favorite book to read on the first day of school. It does a great job of reminding kids that the ones they love are always with them even if they aren’t standing right beside them. Honestly? I’m thinking I need to read this book again before my husband deploys. It’s a great story to remind us that love is more than being side by side. I think every child should read books by Dr. Seuss. I didn’t want the entire list to be Seuss books though so I picked just one! This one is great for kids that are learning to read! It has a lot of simple words that they can pronounce. It also follows true Seuss fashion and has lots of rhyming and fun verses. Perseverance is a great thing to learn about. This book tells the story of an engine that has to keep pushing through even when the odds are stacked against him. This one is great for helping kids see that sometimes you have to put in a little extra work to reach your goals. Plus, what little boy can resist a book about trains? So, there you have it – five books I think every kid should read. My list probably could have contained another 100 books since I’ve been a teacher for 7 years but we’ll keep it short today. Don’t forget to link up your list and check back in next week for the next topic! What’s your top 5 children’s books? 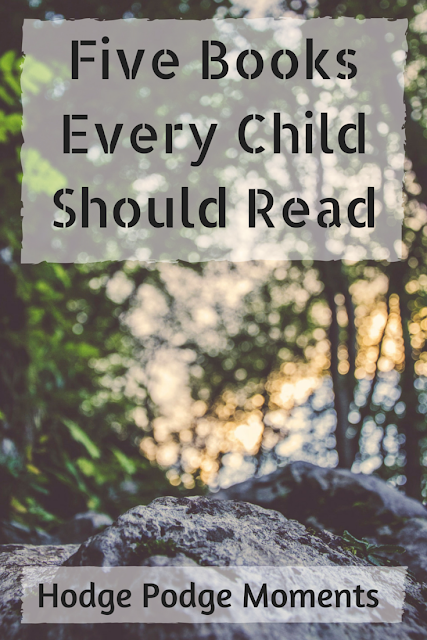 Hi, thank you for this great list of five books every child should read. Sincerely, you have made my day – my aunt has been asking for recommendations on a list of books for her kids. Here you nailed it. “Curious George” is my favourite. Thank you once again. Best Regards.